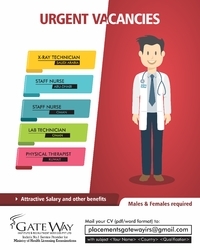 We at Gateway – with offices in Cochin, Calicut, Trivandrum, Kannur, Kottayam and Wayanad with branches planned inside and outside India – have a vast network and cater to the needs of Medical Professionals in Coaching as well as Examination Registration. Our candidates are spread throughout India and we also assist them in finding jobs in the country of their choice. So with our vast database, we would be able to assist you in finding the right candidates for your institution.